Tron (film) Flynn, a young computer genius, breaks into the ENCOM computer looking for evidence that the video game programs he wrote were stolen by Dillinger, an ENCOM executive. Dillinger’s Master Control Program must stop Flynn, and it blasts him into its own computer dimension. Flynn awakens in an electronic world, where computer programs are the alter egos of the programmers who created them, and he is sentenced to die on the video game grid. Together with Tron, an electronic security program, Flynn escapes, destroys the MCP, and is able to return to the “real” world. Released on July 9, 1982. Directed by Steven Lisberger. 96 min. Photographed in Super Panavision 70mm, this special effects tour de force stars Jeff Bridges (Kevin Flynn/Clu), Bruce Boxleitner (Alan/Tron), David Warner (Dillinger/Sark), Cindy Morgan (Lora/Yori), Barnard Hughes (Dr. Walter/Gibbs), Dan Shor (Ram), Peter Jurasik (Crom), Tony Stephano (Peter/Sark’s Lt.). The idea for Tron grew out of director Lisberger’s passion for computer games. He and producer Donald Kushner spent two years researching the technology to make the film, on which he made his live-action directorial debut. The film was the first motion picture to make extensive use of computer imagery, requiring much expertise and imagination. 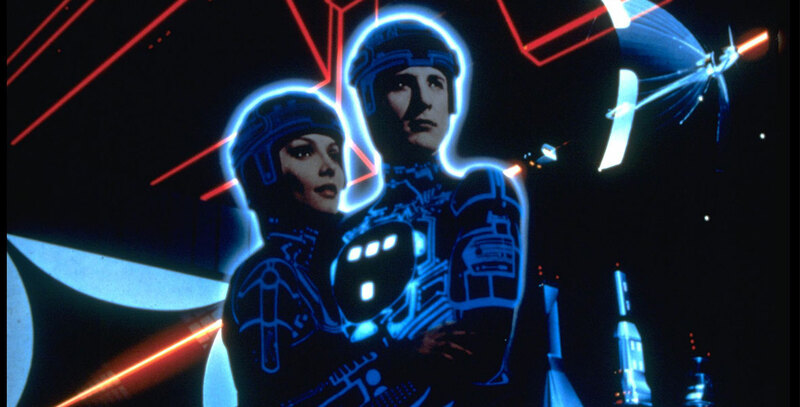 Though computer imagery had been previously seen as an effect in motion pictures such as Star Wars and West World, Tron was the first film to use the technique to create a three-dimensional world. The special effects team was headed by futuristic industrial designer Syd Mead, comic artist “Moebius” Giraud, and high-tech commercial artist Peter Lloyd. Harrison Ellenshaw supervised the effects with Richard Taylor. Computer graphics were first applied to aerospace and scientific research in the mid-1960s, when methods of simulating objects digitally in their dimensions proved as effective as building models. The technology was then diverted into the entertainment field. Information International Inc. (Triple-I), Robert Able & Associates of Los Angeles, the Mathematic Applications Group Inc. (MAGI), and Digital Effects of New York produced the computer imagery for the film. MAGI, the single largest contributor of computer imagery, speeded up the process of supplying its work to Disney Studios in Burbank by a trans-continental computer hook-up. The computer link cut between 2 1/2 to 5 days from the creation of each scene. The electronic world was shot on soundstages at the Disney Studio in Burbank. Photography for the real world took place at locations around Los Angeles, and at the U.S. Government’s futuristic Lawrence Livermore Laboratory outside Oakland, California. The film was not the box office bonanza the Studio had hoped for, but it did spawn a number of popular video games. Tron was nominated for an Academy Award for Sound, by Michael, Bob, and Lee Minkler and Jim La Rue, and for Costume Design by Elois Jenssen and Rosanna Norton. Released on video in 1982 and 1993.